One of the most important choices you can make when forming a business is which of several business structures you decide upon. There are definite advantages and disadvantages with each structure type whether it be a Sole Proprietorship, LLC (Limited Liability Company), Cooperative, Corporation, Partnership or S-Corporation. Your personal choice of type of business should include research into the advantages and disadvantages each type will offer you. Whether you are a new entrepreneur of have previous business experience you should review the specific business requirements for each type of business as they relate to your specific state as these can vary by State. The main advantage of a Sole Proprietorship is it is simple in structure and you alone are entitled to all of the profits. A Sole Proprietorship requires no formal action to start up and is not taxed separately as a business. This type of business is easy to form and you as the sole owner are in control of all decisions. Disadvantages of this business type as you are not only entitled to all the profits; you are also responsible for all the business debt, losses and liabilities. It may be more difficult to raise money as banks or investors will be more hesitant to take a risk. You are responsible for the success or failure of the business. Another choice for your new business is an LLC (Limited Liability Company). Advantages of this structure are the members of the LLC do not expose their personal assets to any risk. The startup costs are still quite low and there are less registration requirements. The profits and losses of an LLC are distributed among members at a predetermined ratio. Disadvantages of this type of business include the business dissolves if one or member leaves. This requires the remaining members to decide whether to start a new LLC or part ways. LLC members are considered self-employed and must pay taxes toward Medicare and Social Security. All net income is subject to these taxes. An alternate method of an LLC is to form it as an S Corp. to take advantage of special tax rules. These rules can vary by State and the advice of an attorney or tax adviser is recommended. A lessor known business entity is a Cooperative. This business type is owned and operated for the benefit of those using its services. A common example is a food co-op where members join and agree to pay a set amount to join or offer services to help with the running of the company. Advantages to a Co-Op are less taxation. Government sponsored grants are readily available to start up. Prices for supplies, materials and services are generally lowered price. If co-op members leave the cooperative remains in existence. Disadvantages of this business type are slower cash flow and the success of the business relies on member participation. There are risks of losing members if disagreements occur as to the amount of effort put into the business by each member. 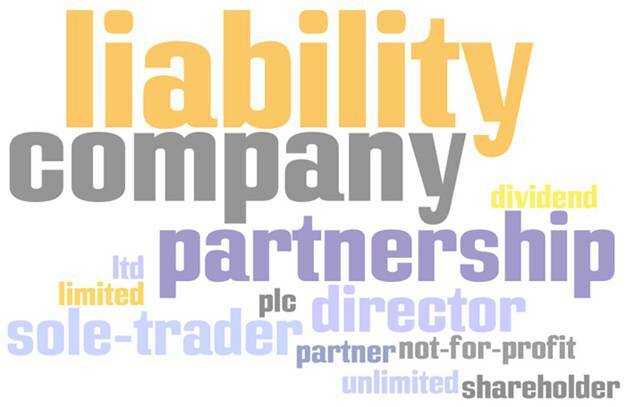 The formulation of a Corporation as a business type has advantages of limited liability. Members and shareholders are not legally liable for the actions and debts of the business. The ability of a Corporation to sell shares of stock allows it to have better cash flow. If a corporation chooses to go “public” the business has the ability to attract investors and a better chance of attracting high quality, talented employees. Generally a Corporation structure allows for a lower tax rate on profits earned and separate tax filing from its owners. Disadvantages are high startup costs, administration fees and complex legal and tax situations. A corporation may be double-taxed. It is taxed on a profit and is taxed again when dividends are paid to its shareholders. It can also be subject to multiple types of paperwork by Federal, State and sometimes Local Government. A Partnership type of formation involves 2 or more people and can be any of three types: General Partnership with equal sharing of profits, liabilities and management. Limited Partnership in which each partner can have limited liability, sharing of profits and overseeing of management decisions. The third type of partnership is joint- usually set up for a limited period of time for a single project. Some advantages of a Partnership are they are easy and inexpensive to form, members share equal investments and one has the benefit of taking advantage of each person’s skillsets. Employment incentives exist when the option of becoming a partner exist which attracts quality, motivated people. Some disadvantages are full shared responsibility of all owners for debts and decisions of all partners. Personal assets are at risk in satisfaction of partnership debt. Along with this comes risk of disagreements amongst partners. Profits are shared regardless of the amount contribution by each partner. An S-Corporation includes advantages of tax savings for both you personally and the business. Business tax credits are available to this type of structure. One of the biggest advantages is an S-Corp does not dissolve if one or more shareholders leave. Disadvantages are requirements for regular shareholder meets including recording of minutes, updated by-laws, stock transfer records and shareholder compensation requirements.